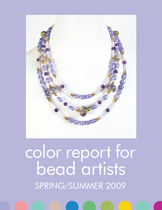 I’ve just published the latest Color Report for Bead Artists Spring/Summer 2009. Its is chock full of exciting new colors to work with, including some of my all-time favorites (which I’ll tell you more about in future posts). The 3rd in a series, the report gives bead artists specific instructions, descriptions, and ideas on how to use the 10 new colors of the season as designated by Pantone, the global authority on color. Pantone chooses its seasonal colors for the fashion, interior, graphic design, and marketing industries. This season’s palette is my favorite in years. One of the most unusual colors is Lucite Green, a lovely tint with a retro feel bringing to mind the 50’s and the pastel revolution. It is cool, light, breezy, and very casual,and funky. Look at this Dorothy Perkins belted batwing tunic that is slightly dark version of Lucite Green. How fun is that?! I love how The Stylish Geek combined it with black and white.